BENZENE LINE is developed for production of benzene used as counting media for Conventional Radiocarbon Dating, where benzene sample is counted by Liquid Scintillation Counting. Benzene line widely uses vacuum pyrolysis in benzene production process. 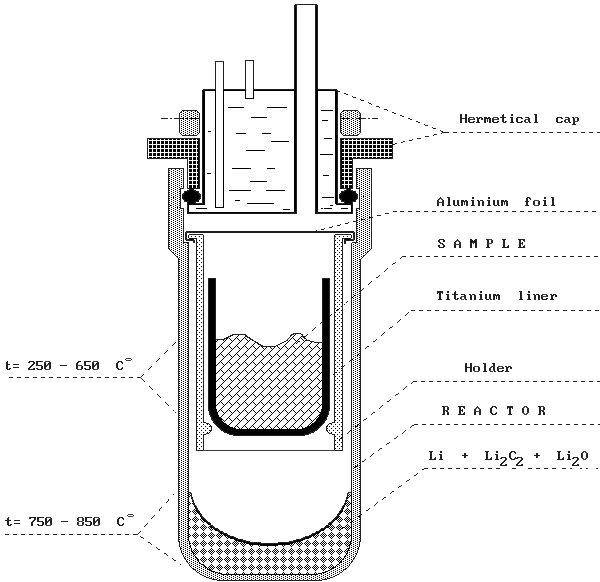 Vacuum Pyrolysis Application in Radiocarbon Dating ( 1998 ) : The direct chemisorption into a lithium alloy of carbonaceous gases produced by the controlled thermal degradation (pyrolysis) of organic materials under vacuum (see scheme of reaction vessel operation on Figure). This approach offers the advantage of a single stage, highly efficient and economical procedure for the production of lithium carbide. It is applicable for most types of sample material encountered in routine dating work and including organic detritus dispersed in a highly (up to 95% by weight) mineral matrix and/or carbonates. Bone collagen can also be processed without the need for its prior extraction and purification. Initial Idea of vacuum pyrolysis application in radiocarbon dating was published in 1998 [ Skripkin and Kovaliukh ]. Future developments are enclosed in materials used in Benzene line, and knowledge given in user's manual and during of staff training. We use selected material - Titanium, Teflon, Stainless Steel and Boron-Silicate Glass. Our general approach is to optimize volume (diameter and length) of benzene line. Vacuum pyrolysis fits into base idea of benzene line - minimize of volume - in metal reaction vessel. Novel similar applications for producing of small benzene samples have: capsule technology produces carbide high productively; it allow us to obtain small benzene sample; it is well aplicable for both organic and carbonate samples; it is cheep and high effective; microliner thermodestruction technology is a simple and highly productive for any kind of sample material; it have some peculiarities in aplication for organic and carbonate samples. It is cheep and extreme effective. Up to 2-5 times reduction of time for sample processing cycle.